Full dynamic lighting for an infinite number of local light sources. Special effects such as ambient occlusion and depth of field. Sky and water environments appear and function the same regardless of whether lighting and shadows are enabled. Note: You must be running Second Life Viewer version 2.7.1 or later to use this feature. This feature requires an OpenGL 3.0-capable graphics card, such as Nvidia GeForce 8600 and 8800, GTX 2xx, or Radeon HD 4xxxx. If your graphics card cannot support the feature, then it is disabled by default, and you cannot enable it. Check Atmospheric shaders (under Shaders) and Hardware skinning (under Avatar Rendering). Note: In general, enabling lighting and shadows lowers the frame-rate somewhat; by default the feature is disabled on hardware where the typical frame-rate would be decreased below 10FPS. When you check Lighting and Shadows, you can then enable Ambient Occlusion, Depth of Field, and select the desired type of Shadows. To enable Water Reflections, check Basic shaders. Options are "Minimal", "Terrain and Trees", "All static objects", "All avatars and objects", "Everything". Warning: Lighting and Shadows can greatly lower performance and conflict badly with antialiasing. If you crash when trying to enable Lighting and Shadows on an otherwise supported system, disable antialiasing. Shadows are cast in the direction opposite the sun or moon (or other light source). Shadows start fading away as the distance to the object approaches your draw distance (set in your graphics preferences). Faces far from the camera (more than about 256 meters) will not receive shadows. As they approach this distance, the received shadows quickly fade away. Particles that are not full-bright (this can produce cool "shafts of light" effects). Full-bright surfaces (opaque or transparent) cannot receive shadows. Alpha pixels that are less than 40% transparent. Full-brights, glowies, sculpties, avatars, foliage, ground. Alpha pixels 40% or greater transparent. An object that both casts and receives shadows can cast a shadow on itself. For example, an avatar's arm can cast a shadow on the avatar's leg, where appropriate. Full-bright bumpy objects render the same as they would with lighting and shadows off. Non-full-bright bumpy objects display realistic lighting for the depth-like roughness of the bump texture, according to the direction of the lighting. You experience somewhat smoother lighting from sun, moon, and local lights. Shininess on non-full-bright surfaces looks different. Any number of lights now light the scene simultaneously. Increased accuracy in lighting means that a bright light near a surface may now light nearby points on that surface more intensely than previously. Setting Shadows to Sun/Moon causes all qualifying objects to cast shadows and have shadows cast upon them. When you select Sun/Moon + Projectors shadows, objects cast shadows from the light of the sun and the moon and up to two projector light sources. Shadows are only cast from the two most significant projectors in the scene. Point lights never cast shadows. You may use shadows settings with or without ambient occlusion. Enabling ambient occlusion causes a subtle darkening of nooks and crannies in shapes. Enabling Ambient Occlusion and setting Shadows to Sun/Moon simultaneously exhibits both effects, with the added effect that shadows are smoother (softer and blurrier). Check Depth of field to make objects far from the focal distance appear fuzzy or out-of-focus. Learn more about depth of field — you can fine-tune settings and achieve effects like tilt-shift (miniature-looking scenes), as shown on the login screens. 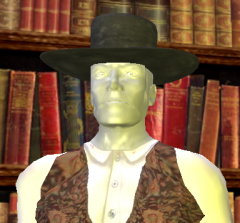 Tip: The depth of field feature can be useful when taking photographs of items for sale inworld and on Marketplace. Learn more about photographing your products. Creating and editing a light source is the same as in previous releases, but the Build Tools provide some additional options when Lighting and Shadows is enabled, as shown at right. The standard light attributes color, intensity, radius, and falloff have the same effect regardless of whether Lighting and Shadows is enabled. A projector is a light source that casts a directional, textured light similar to that of a slide projector. To create a projector light source, select a texture for it in the build tools. The features of projectors are visible when Lighting and Shadows is enabled. It respects the FOV, Ambiance and Focus attributes. It only casts light along its negative Z-axis: the light is directional, and may be pointed at things like a flashlight. Thus, the effect of a projector's light depends on the rotation of the object with the light. The projector's light has the selected texture, tinted with the color selected alongside it, like a slide-projector. You have selected Sun/Moon + Projectors for your Shadows preference. The projector is one of the two closest to the object casting shadows. Projectors do not project textures onto alpha/transparent faces that have partial transparency. Such faces are lit by the projector as if Lighting and Shadows were disabled. When Lighting and shadows is disabled, a projector behaves like a point light, but it continues to obey the Color, Intensity, Radius, Falloff attributes of the light. This essentially makes it operate like a spotlight. A projecting prim reflecting in a shiny surface exhibits a reflection of the prim's projected texture. This is increasingly sharper and brighter, the shinier the reflecting surface is. The FOV setting defines the field of view of the projector, in radians. The field of view is the angular width of the cone of light projected. The possible range of values from 0.0 to 3.0 correspond to widths from 0 degrees to approx 172 degrees (almost a hemisphere of influence). Fidelity of shadows caused by a projector may degrade as the FOV becomes larger. A projected texture appears blurrier the further the projection point is from the projector. The Focus value controls how attenuated this effect is. Positive values keep the projection sharper for farther distances, negative values make the projection start to blur at a closer range. Ambiance adds a very blurred version of the projected image to all faces within the cone of influence, regardless of whether they are in shadow or facing away from the projector. The goal is to roughly simulate light influence being diffused in all directions by surfaces receiving a projected image. Thus it is acceptable that this be even brighter on faces facing away from the projector. The brightness of this effect is proportional to the Ambiance value. The generated light may appear brighter on surfaces close to the light source. Lights whose areas of influence overlap may make that area seem lit much more brightly than previously. Every light in the scene will have a cumulative influence on lighting (not just the closest six lights). These exceptions may not apply to light falling upon transparent or alpha-textured faces: faces with a lot of partial transparency appear essentially identical (apart from shadows falling upon them) regardless of whether Lighting and Shadows is enabled. Note: In general, enabling lighting and shadows will lower the frame-rate somewhat; by default the feature is disabled on hardware where the typical frame-rate would be decreased below 10FPS.